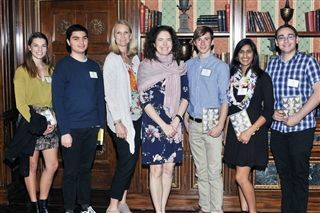 Dr. Diana Abu-Jabar was honored on February 13 during Rancho Santa Fe Literary Society's luncheon at the Grand Del Mar Hotel and several Pacific Ridge students were invited to have a discussion with the author. They read her latest memoir, Life Without a Recipe and used the opportunity to ask questions. English teacher Ms. Juskaitis said the students showed great poise and enjoyed the stimulating conversation.